It was 4 March 1941 in the Henry B. Nevins, Inc. Shipyard in City Island, NY, when the keel was laid of the first United States "Yard class Minesweeper" designed by this company and listed as YMS-1. Launched on 10 January 1942, it was completed two months later on 25 March 1942. This yard held the distinction of building this ship in 3 months, 18 days. The first wooden minesweeper of this class was to gain prominence in all theaters during World War II. A total of 561 were built at various U. S. yards. Originally a class of Motor Minesweepers, "Yard " was added to distinguish them from other classes. Referring to a "Naval Yard or Naval Base." This type was not expected to go beyond adjacent waters from their base. Built at 35 yacht yards, rather than larger shipyards; 12 on the East Coast; 19 on the West Coast, and four in the Great Lakes. It has been established by the U. S. Navy that this is the reason for the "Yard" designation. Records show that YMS' were used in the United States Navy to sweep mines laid by enemy subs as early as 1942 off the ports of Jacksonville, FL and Charleston, SC. One of their greatest losses being on 9 October 1945, when seven U.S. YMS' were sunk in a typhoon off Okinawa. The wood-hulled YMS proved to be one of the U.S. Navy's more durable and versatile types through a quarter-century of service, filling a variety of roles for a number of navies. All 481 ships of this type had the same general characteristics. The only significant variation within the type was one of appearance; YMS-1 through 134 had two stacks, YMS-135 through 445, 480, and 481 had one, while YMS-446 through 479 had none. Originally rated as service craft, they were used during World War II for inshore sweeping to prepare the way for amphibious assaults. Surviving YMS's were reclassified as AMS in 1947, given names, and rerated as mine warfare ships; in 1955 they received the new type symbol MSC(O), changed to MSCO in 1967. These ships bore much of the mine warfare burden in Korea, formed a major portion of our minecraft strength through the 1950's, and provided underway training for Naval Reservists in the 1960's. Ruff (MSCO-54), originally YMS-327, the last of her kind in U.S. service, was struck from the Navy List in November 1969. Eighty ships of the 136-foot YMS type were ordered by the U.S. Navy specifically for transfer to Great Britain under Lend-Lease. For accounting purposes they were carried on the Navy List as "British Motor Minesweepers" (BYMS) and numbered in a separate sequence from 1 to 80. Upon transfer to Britain, BYMS-1 to BYMS-80 were assigned the British pendant numbers BYMS-2001 to BYMS-2080. Their general characteristics were identical to those of their U.S. Navy counterparts. Names were not assigned them by the Royal Navy. Seventy more BYMS' bore hull numbers from 137 to 284. These were originally built for the U.S. Navy as YMS' and transferred to Britain on, or shortly after, completion. On the Navy List they were designated BYMS, with their original U.S. Navy numbers. 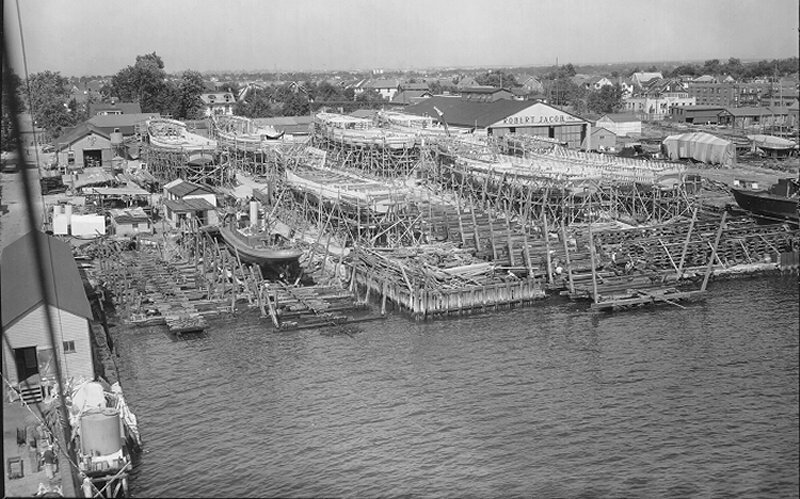 A view of the Robert Jacob Shipyard, City Island, NY, c. July 1944, which shows Harbor Tugs, Vospers, and YMS Auxiliary Motor Minesweepers under construction. In 1946 the Robert Jacob Shipyard was sold to Consolidated Shipbuilding of Morris Heights. Consolidated then over a 2 year period relocated completely to City Island. Consolidated remained in business until 1957-58, was then sold to Wes Rodstrom who operated the yard from 1959 to about 1963 as Rodstroms Yacht Yard then changed the name back somewhat to Consolidated Yacht Yard. Today Consolidated Yacht Yard is still owned by Rodstrom family. Photo courtesy of the City Island Nautical Museum and Tom Nye. Did you ever eat on a YMS? when we hit the wake of a floating leaf. what dire calamity caused all this? A passing school of playful fish. she's taking off for another planet. our clothes line boys is aft of the stack. are always full and gosh, the tension. four rubber sides would have been convenient. they're a secret weapon gone insane. the Navy designed them and laughed and laughed.